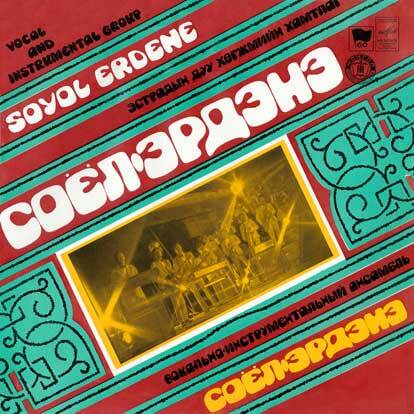 Soyol-Erdene (Соёл-Эрдэнэ) were, and apparently still are, the first rock band of Mongolia. The Mongol Empire was founded by Genghis Khan in 1206. Following the collapse of the Yuan Dynasty, the Mongols returned to their earlier pattern of constant internal conflict and raiding of the Chinese borderlands. By the end of the 17th century, all of Mongolia had been incorporated into the area ruled by the Qing Dynasty. After the collapse of the Qing Dynasty in 1911, Mongolia declared independence, but had to struggle until 1921 to firmly establish independence from the Republic of China. As a consequence, it came under strong Russian and Soviet influence. In 1924, the Mongolian People’s Republic was declared, and Mongolian politics began to fall in line with the Soviet politics of the day. After the fall of the Iron Curtain in late 1989, Mongolia saw its own Democratic Revolution in early 1990. Soyol-Erdene was established in late 1971. The Minister of Culture of that time, famous novelist Chadraabaliin Lodoidamba called four young musicians and said: “England has a band The Beatles of four young men. Why shouldn’t we have a similar band?” The four young musicians, who had recently graduated the School of Music and Dance in Ulaanbaatar (now called College of Music and Dance) as yatga (ятга) players, established a rock band. The members were Tserenbat (drums), Erdenekhuyag (guitar), Batsaihan Jamyan (bass) and Naranbaatar Badamgarav (keyboard). The first compositions of the band were Mongolian folk songs in a rock style arrangement. They often used poems of famous Mongolian writers. In fact, the name “Soyol Erdene” – which roughly translates as “cultural jewel” – is the title of a melodious popular song of 1920s which the band played on an electric guitar. During Soviet rule, the band worked under the administration of the State Philarmony which also supervised the Mogolian symphony orchestra as well as Mongolia’s other rock band – Bayan Mongol Variety Group. The band was often criticized by the MPRP Censorship Board for the promotion of the Western musical style and Western fashion. Soyol-Erdene are supposedly still active. They have a MySpace page, although it has not been updated in sometime. Catalog number C90-15961-2 on the Soviet state-owned and operated Μелодия (Melodiya) label, released in 1981.